Today’s guest picture comes from my brother’s expedition to Wales. Having left Chester, he headed for Anglesey but found Snowdon in his way….so he walked up it. I wasn’t very happy with the colour that my pocket camera found in the lithodora’s blue flower or in the mystic Van Eijk pink tulips so I took my Nikon out today and shot them in RAW to stop the camera’s software making decisions that I didn’t agree with. I think that the results are more true to what the eye sees. And while I was there, I took the real Van Eijks…. …and a stream of standard blue ones. The main business of the morning though was not footling about with cameras, but putting in the second of the two new veg beds. Mrs Tootlepedal likes to have things right so this involved not just digging and shifting soil, but using gardener’s string and a spirit level too. After the bed was levelled and settled, I left her to sort out the soil and mowed the middle lawn. This involved stamping on a lot of moss but there was enough grass growing there to fill the lawn mower’s collecting box. Mrs Tootlepedal called me over when I had finished as she had come across something unusual. It was very green. I am not at all knowledgeable about caterpillars but some research says that this might be an angle shade caterpillar. I would be happy if a reader can put me right. I went in to make some potato and onion soup for lunch and had a look at the birds while it was cooking. The plum tree is making a very picturesque background for birds waiting to visit the feeder. After lunch, I inspected the tulips. It had been a sunny morning, although it hadn’t felt very warm because of a chilly east wind, and the sun had been enough to open a few petals. I deadheaded the first of the daffodils to go over. This was the first of many dead heading activities to come. It is a bit tedious but it keeps the garden looking neat and it encourages the daffodils to come again. I checked out the veg beds. They are both the same size although the camera angle makes one look a lot shorter. Mrs Tootlepedal likes the slightly wider paths between the beds that the new layout had created. The wire netting covering is to protect the soil from cats. I will have to sieve more compost as there has been quite a lot used lately. …before I got my bike out and went for a pedal. It was a lovely day as far as the sun went…. …but the wind was hard work when I was pedalling back into it so I was pleased to stop and admire a couple of oyster catchers on a wall at Bigholms. When I looked across the wall, I could see the windfarm on the horizon and I reckoned that this must have been an ideal day for ‘green’ energy with the combination of bright sun and a stiff breeze. Now they need to get busy on working out the best way to store it so we can have some to hand when the wind isn’t blowing and the sun isn’t shining. I had enough personal energy left to cycle through the town when I got back to it and go a couple of miles out along the road north. I was very surprised by the colour of the soil in this field beside the Ewes Water. You can see the edge of the field in the bottom of the picture that I took looking up the valley. I managed to add a couple of miles to yesterday’s trip and got home after 16 miles. If the weather permits, I will try to add two miles to my journey every time that I go out for the next few days until I have got back some of the fitness that I lost in an almost cycle free March. I am taking things steadily as my foot is still tender but the gel insoles for my shoes have been very successful and I would like to thank those who advised me to get them. I haven’t tried a walk of any length since I got them, but the ordinary walking round the house and garden is very satisfactory and limp free. The slow cooked lamb stew made its third and final mealtime appearance tonight, this time in the form of a light curry with rice. The dry cool weather with sunny periods seems set to last for a good few days so I hope to be able to continue to get out and about (as long as my foot continues to be co-operative). Today’s guest picture comes from our friend Bruce who had been touring the border hills country when he stopped to take this picture of the waterfall known as The Grey Mare’s Tail. It was a theoretically warm day today with the thermometer registering 10 degrees but a very chilly northerly wind made it feel much cooler. Still, it was dry as we cycled to church to sing in the choir so we weren’t complaining too much. We had a cheerful set of hymns to sing today which made up for the grey weather. When we got home, I took a general view from an upstairs window of the middle lawn which is currently surrounded by daffodils. The shrubs are adding a bit of colour to the borders too. Then I had a look at the birds while I drank a cup of coffee. The sunflower hearts are quite big for the small birds’ beaks and there is a lot of spillage. There is always a ground squad about to make sure that none of the fallen seed is wasted. I counted fifteen chaffinches waiting under the feeder for manna from heaven today. Some of the chaffinches tried to get onto the perches but this one waved its wings ineffectually and didn’t shift any of the incumbents. There was a steady churn of birds coming and going with some strong sentiments expressed along the way. There is not much happening in the garden at the moment so rather than walk around it, I went off for a pedal on my new bike. I was well wrapped up and with the wind behind me, it was an unalloyed pleasure to cycle up to the top of the hill at Callister. It was quite a bit harder to battle back down the hill into the town but I managed to go a little bit further than I did yesterday and a little bit faster too so I was quite happy. When I got home, I found that Mrs Tootlepedal had recovered her health well enough to have moved one of the new vegetable garden frames into place. The new frames are intentionally narrower than the old frames so there will have to be some digging before they get fully settled in. I noticed that more blossom had appeared on the plum tree so I recorded that fact before going for lunch. After lunch, I had time to go through a few of the songs that we are doing with our Carlisle choir before it was time to go off to Carlisle to sing. I spotted a goldfinch trying out the peanuts as I was getting ready to go out to the car. It didn’t look very happy but it had a good nibble before it flew off. Our choir practice was excellent. Our conductor was in very good form and the choir was responsive so we got a lot done. The current set of songs have a lot of good singing in them and are difficult enough to keep me working without being so hard as to make me depressed. With two concerts, a church service and three practices since Tuesday, it has been a full week of singing and it is very heartening to find that the combination of speech therapy and singing lessons helped my previously creaky voice to survive. 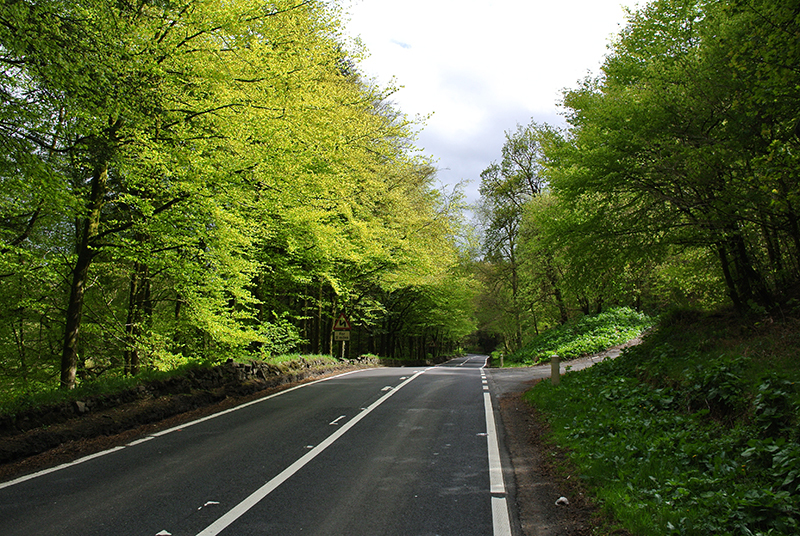 We drove home in a sort of hazy sunshine but by the time that we got back to Langholm, it was all haze and no sunshine. 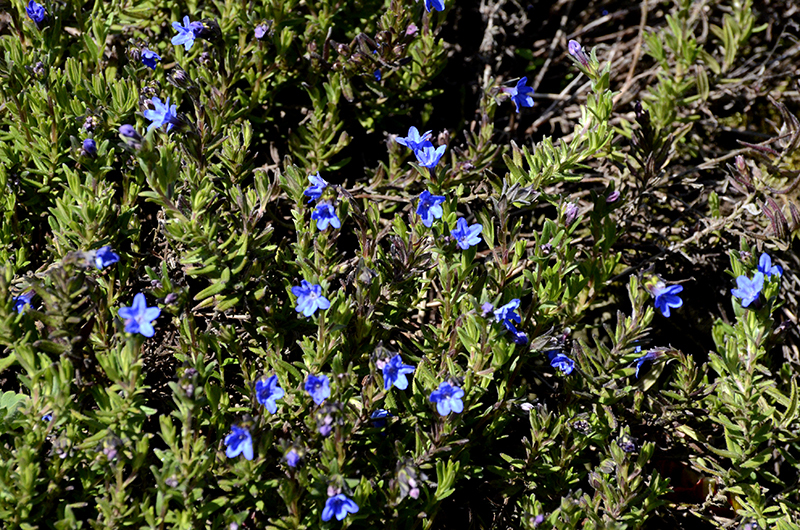 As we parked the car, I saw that the first of the Lithodora ‘Heavenly Blue’ flowers had appeared. 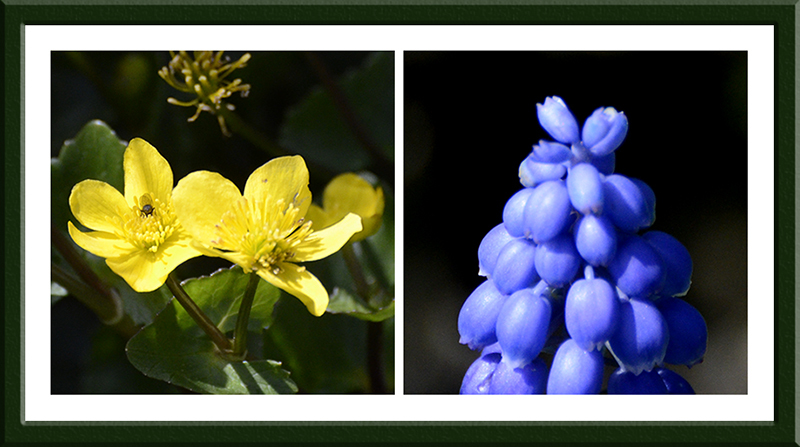 My camera resolutely refused to show just how blue the flower is so I will have to try again in a different light. It had no problem even in the dim light with the glorious colour of the cowslippy things which are going from strength to strength…. …and it enjoyed the fresh green of a philadelphus by the hedge. Although the light was fading now, there was enough left to show a redpoll visiting the feeder. It was just in time because although I had filled the feeder twice during the day, the seed was almost all gone again. I had made a slow cooked stew with a rolled shoulder of lamb in the morning before going to church and Mrs Tootlepedal cooked some mashed potatoes and cabbage to go with it and the result was entirely satisfactory. The slow cooker is a wonderful thing. Looking at the forecast, an easterly wind is set to continue for several days so spring may remain on hold for a while. The flying bird of the day is two chaffinches, looking a bit uncertain of which is the best way to go. You can’t avoid Brexit metaphors these days. Footnote: I don’t generally use a photograph if I haven’t taken it on the day of the post but I found that I had overlooked this one from last Wednesday. It was too bright to waste. It shows the eye popping display of flowers at the Houghton Hall Garden Centre. This is where Mrs Tootlepedal found her cheerful primrose for the chimney pot, though hers came from a subsidiary bench where bargains were to be found. 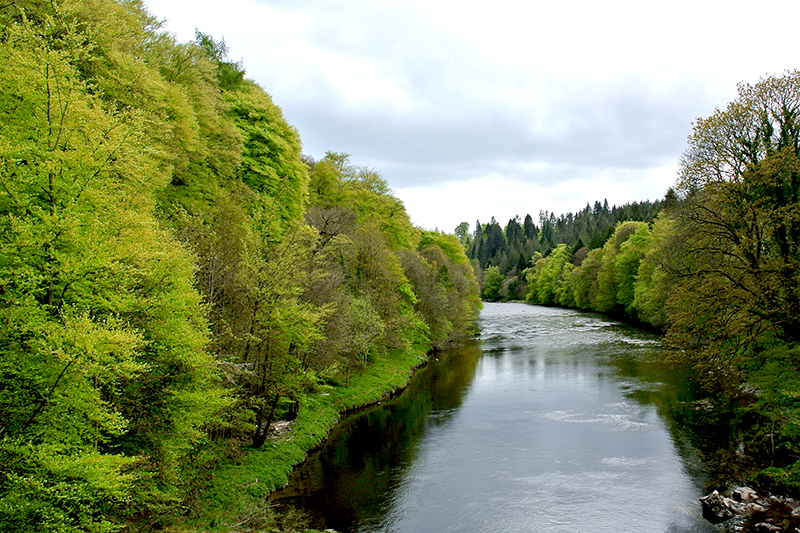 Today’s guest picture comes from my brother Andrew who is working his way back south after his visit to Langholm. He took this picture of Morecambe Bay in the distance from the wonderfully named Hutton Roof. By the time he got down to the seaside, the tide was out. Our spell of excellent weather continued and it now feels as though we have had more good days this year already than we had in the whole of last year. Long may it go on. My throat was still strangely creaky (but with no other ill effects) so I pottered about in the morning, looking at young birds…. Dad looks a little fed up with the incessant demands of the big baby. A fluffy dunnock looked a bit unhappy…. …until it found a more secure place to rest. …as well as supervising the hard working Mrs Tootlepedal, sieving a little compost and mowing the middle lawn. And looking at some small flowers. …and along with the more showy flowers on the back path, there are some nice clumps of sweet woodruff. There were some grown up birds in the garden too. Mrs Tootlepedal edged the lawn after I had mowed it and I took a picture in the late afternoon to show the effect that all this care had. I made some carrot and lentil soup for lunch and then, after a restful moment or two, I got the new bike out and went round my standard 20 mile Canonbie circuit. Lots of trees. The Esk is fully clothed at the Hollows now. …but I would have needed to spend a lot more time to get good shots as the butterflies were in a flighty mood. There was time for another walk round the garden when I got home. Mrs Tootlepedal’s greenhouse is full of plants waiting to go out…. …but there are quite a lot already in place in the vegetable garden with individual greenhouses. You may have heard of bottle green. These are green bottles. The drumstick primula in front of the pond was looking lovely. …and it is hard to pass the rhododendrons without the shutter finger twitching. In the evening, Susan arrived and gave me a lift to Carlisle where we enjoyed a very entertaining evening of recorder playing with our group. As an added bonus, we were treated to a very elegant new moon in the sky as we drove back. Sadly, it was behind the hill by the time that we got home. Although not a flying bird, the most interesting animal we saw all day was this amazing pig in our neighbour Liz’s garden. It was having a rest on a journey from Corby to Aberdeen. The actual flying bird of the day is a greenfinch leaving the feeder in a hurry when Mrs Tootlepedal went out to shut up the greenhouse for the night. Today’s guest picture shows the railway station from which my brother began his walk up Snowdon earlier this month. The mountain is in the background. We had a traditional Sunday today. Mrs Tootlepedal went off to sing with the church choir and I prepared a beef stew for the slow cooker. She came back from singing in the church, we had an early lunch and then we went off for an extra long ‘singing day’ (1pm to 6pm) with our Carlisle choir. We came back from the singing and got ready to eat the stew only to find that although I had put the stew in the slow cooker and switched the slow cooker on, I had not actually managed to switch on the socket in the wall so slow cooking had turned to no cooking. Traditional methods were applied and we ate the stew an hour and a half later than planned. Not my finest moment and ironically, Mrs Tootlepedal had remarked as we drove back from Carlisle that it was really good to know that we would be coming back to a ready prepared hot meal. Ah well. This was not the only disappointment of the day. 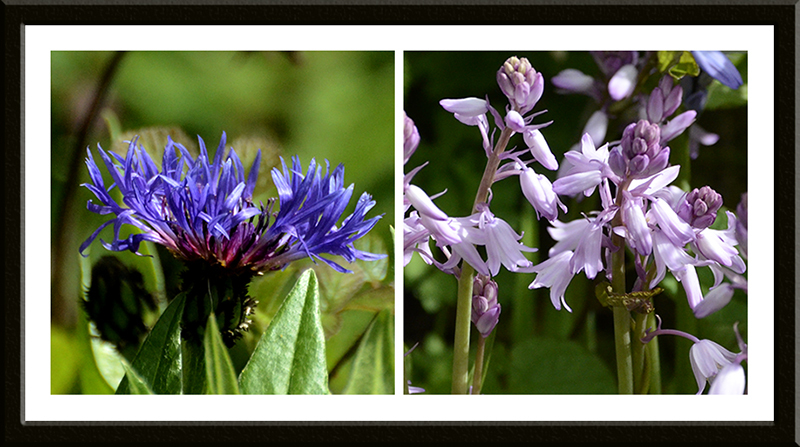 It was raining when we got up but by the time that I had prepared the stew, the sun was shining so I went for a walk, hoping to see a wonderful display of bluebells in the woods beside the river. The park looked very springlike…. …and very pretty but in no way forming the complete carpet of the woodland floor which I had hoped for. The growth looks thin for some reason. Perhaps the trees came into leaf too soon and stopped the light getting through. Leaves seem to be coming rather early this year and oak trees and our garden walnut are already out. 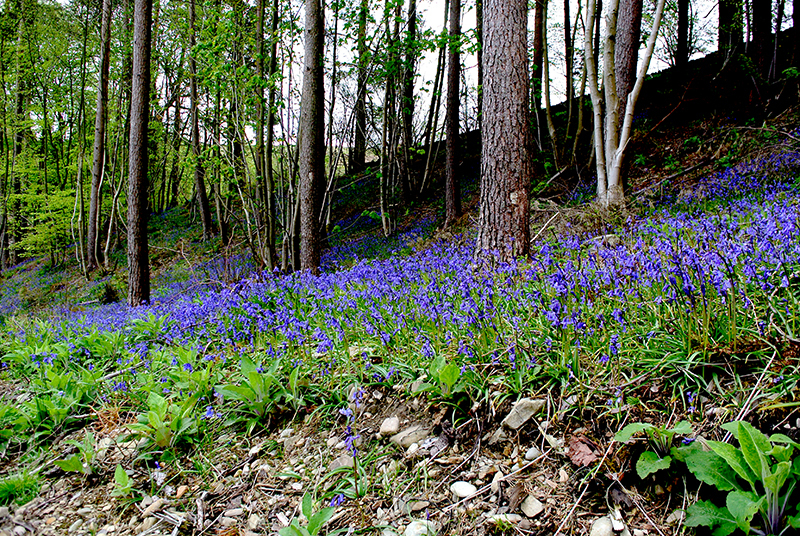 I had a last look at the bluebells…. …and went back home to have a look round the garden. There was some good blue there in the shape of the lithodora which is flourishing. Mrs Tootlepedal has two cultivated geums. This is the louder of the two. 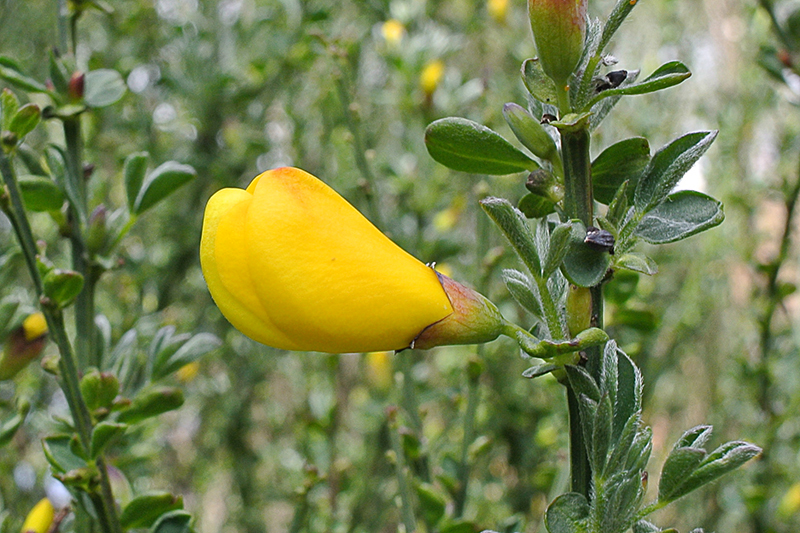 It is in competition with one of the azaleas for the loudest orange plant in the garden. I was very happy to see quite a few infant plums on the plum tree. Mrs Tootlepedal picked the first crop of the year from the vegetable garden. …and found the first salad leaves of the season to go with the radishes for lunch. I look forward to having lettuce and marmite sandwiches on the menu soon. It was such a lovely day that there was still plenty of light when we got back from the choir and I had another look round. The Japanese azalea is showing its first flowers…. …as is the fuchsia on the back wall of the house. …and some slightly curly yellow ones which were the last to flower. …and I am keeping a close eye on them (and the gooseberries) for any sign of sawfly. I had time, while the stew was cooking, to mow the middle and front lawns and the drying green so the slow cooker failure did have an upside. In the continued absence of any birds, he flower of the day is the clematis at the back door. Today’s guest picture shows Sandend harbour in Banff, on the north east coast of Scotland. Gavin passed it on a walk today as he is on holiday up there. We had another dry day here today, although one or two spots of rain did fall in a half hearted way in the afternoon. After breakfast I had to frame a couple of wild goat pictures for a Moorland Exhibition in the Welcome to Langholm Centre in May and then I had a walk round the garden. in spite of the frosty weather earlier in the week, many tulips have done very well and even some of the Ballerinas have survived…. …and more tulips are arriving every day. The tulips that Mrs Tootlepedal bought at Alnwick have survived the journey home and the cold and are looking very healthy. Here are three of them. I couldn’t pass the anemone by without taking a picture…. 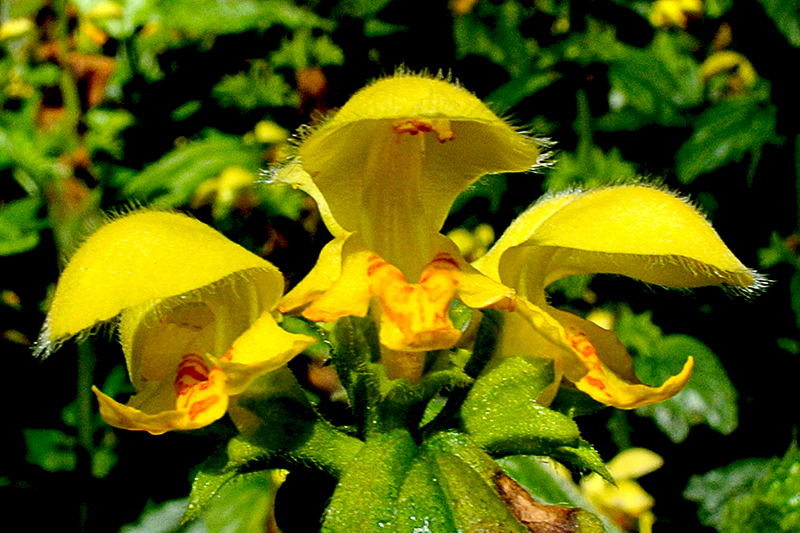 …because they are delicate flowers and it might be gone if there is a heavy shower of rain. Although progress is slow because of the recent chilly mornings, new flowers are arriving. I was very impressed by the volubility of a blackbird as I went down the drive in front of the house. I didn’t have long to look around though because I was delighted to leave the garden to partake of some treacle scones brought round by Dropscone to go with our first cup of coffee for a while. Dropscone followed his trip to Skye with a golfing break so he has hardly seen his home for a fortnight. He hasn’t lost his scone skills though. After he left, I had to go to the health centre for a routine check but i had time to check on the perching redpolls first. After lunch I went off for a cycle ride. The wind had dropped considerably from recent days and had moved round from the north so it was both quite a bit milder and much more helpful as I cycled back to Langholm from Canonbie. I concentrated so hard on the pedalling that i forgot to take any pictures at all. When I got home, I took my framed pictures up to the town and helped hang them on the wall beside some offerings from the local art club. The Moorland Exhibition has been well publicised so I hope that they get plenty of visitors. In the evening, Mike and Alison came round and Alison and I had an enjoyable time playing as always. On a sobering note though, we put a metronome on as I felt that we were slightly rushing a slow movement in one of the pieces. ‘ Slightly rushing’ turned out to be an understatement as were well ahead of the pace after only four bars. We shall have to learn to apply the brakes. 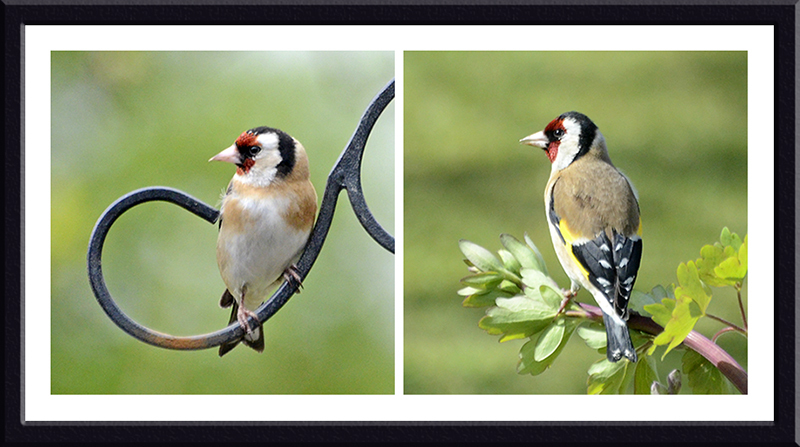 The flying bird of the day is a goldfinch, looking a bit shifty I thought. Today’s guest picture is a taster from Sandy’s visit to the other side of the Atlantic. He claims it is Las Vegas but I seem to have seen that statue somewhere before. Our spell of calm, dry weather continued today with the added benefit of temperatures remaining well above freezing. I had a gently full day which started with a visit on my slow bike to the High Street to take some folded picture cards to the paper shop. I continued in a circle past the cash machine and our corner shop, topping up with necessities at both. I then spent some time looking out of the kitchen window. I set the camera up on a tripod and waited. Normally going to the trouble of putting the camera on a tripod means that there will be no birds to watch while it is up and just recently, birds have been hard to find anyway so I wasn’t very positive. For some reason though, today was the day and there was steady procession of obliging chaffinches, coming and going…. …for the whole time that I was watching. …and I clicked away happily. It came as quite a surprise when one actually paused for a moment on the feeder. I could have done with the weather being a bit brighter…. …but otherwise I couldn’t complain. And all the chaffinch pictures above were taken in a four minute period. Sometimes I wait for ages and no flying birds are available. After a while, other birds arrived and the feeder became a centre for cross cultural conversation. I had a cup of coffee with Mrs Tootlepedal, did the crossword and then pottered around putting on cycling gear and pumping up my tyres until I finally got out for a ride just before midday. I took the well travelled route across the hill and down to the bottom of the Canonbie bypass, returning by the old A7 and managed to maintain a very steady and respectable (for me) speed throughout. I didn’t stop for any pictures but I had to stop whether I liked it or not when my front mudguard finally broke catastrophically. I have been patching the mudguard up with tape for some time but this fracture was fatal and I threw the thing away in a handy litter bin and cycled home with a naked front wheel. I will have to do something about this because cycling on wet roads getting soaked by a shower of my own making is not among the things that I find attractive. After lunch and shower, I visited the offices of our local paper. On my way, I was waylaid by a couple of vocal robins. After continuous publication since 1848, our local paper, The Eskdale and Liddesdale Advertiser is facing closure later this month by its present owners, a Carlisle local newspaper group. The editor is trying to ensure that the extensive photographic archive stays in the town so I went to see what the Archive Group could do to help. After a constructive conversation, I went off for a short walk in the gathering gloom. As I passed the ducks on the Kilngreen, they took exception to my presence and dived off into the river. On a grey day, I had to find any colour where I could. 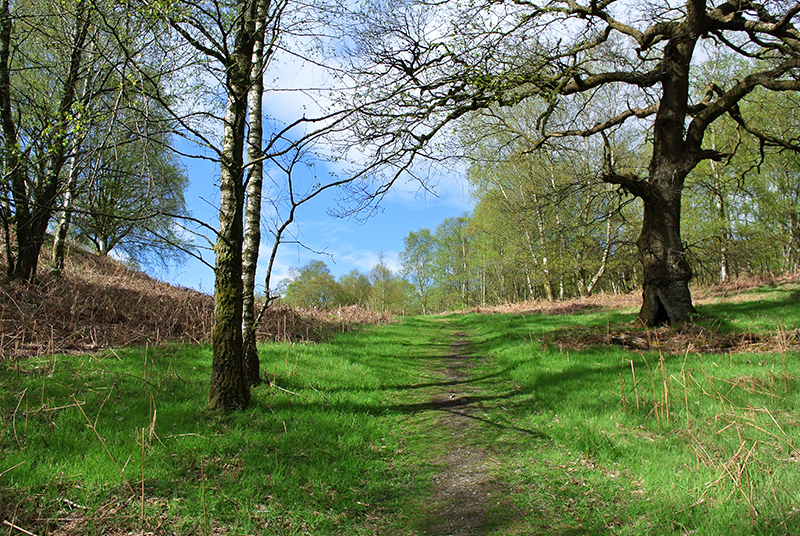 There was certainly hardly any to be seen on the Lodge Walks…. A little brightness was provided by a snowberry bush on the bank of the Esk. When I got home, I thought of making crumpets to cheer myself up but it seemed like a rather elaborate process so instead, I made some dough in the bread machine which turned into bread rolls later in the evening. In the meantime, a good dish of macaroni cheese for my tea made up for any crumpet deficiency and the evening was rounded off very well by a visit from Alison and Mike Tinker. Alison and I tinkled and tootled away cheerfully and occasionally correctly on electric harpsichord and flute and then we joined Mike and Mrs Tootlepedal for conversation. Any day with a pedal and a tootle is a good day by definition but when it is a dry, calm day in December with added chaffinches and conversation, it is a very good day indeed. …and the flying bird is one of the obliging chaffinches trying out a new “no tail” flying style. 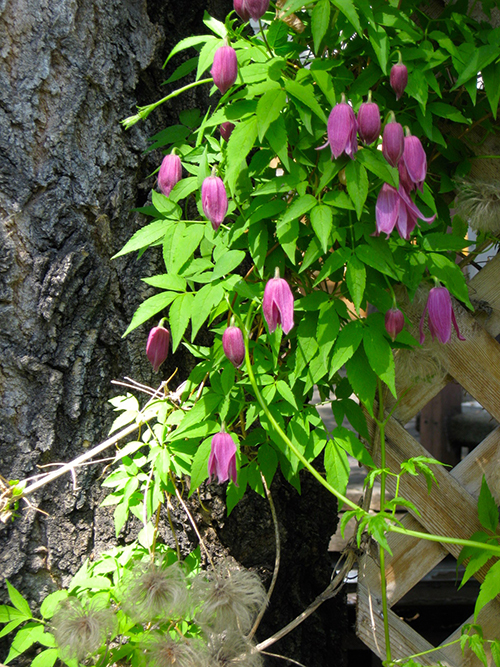 Today’s guest picture is a very nice clematis in Manitoba sent to me from across the pond by Mary Jo. She tells me that they are expecting snow. It has not been a good spring here or there. We had another fine day today but with a strong and chilly wind still very much in evidence. I spent most of the day keeping out of the wind. Dropscone helped me by dropping in for coffee and he was rewarded with several sticks of rhubarb of which is fond. When he left, I girded up my loins and went outside to mow all three lawns. I had just finished when I was visited by Mike Tinker, his son -in-law, Lorne and two of his grandchildren. Sara and William immediately headed for the pond and were delighted to be able to surprise a frog while Mike, Lorne and I considered the state of the world in general and the lawns in particular. I was bemoaning the fact that I no longer have the capacity to properly spike the lawn when Lorne offered to come down and spike it for me in the autumn. It would be wonderful if he did. Having a lawn spiked by someone called Lorne would be a clear case of nominative determination (and jolly useful too). When they left, I had a wander round the garden. In spite of things being very backward because of the cool spring, there is colour be seen and my currant favourite is this lithodora. The blue flowers seem to float above the dark green foliage. Brasher colours are to be seen too. Sadly a couple of very cold mornings a week or so ago have put paid to two of our azaleas and killed off every bud. Some have survived though and a rhododendron is just about to burst into flames. After lunch, I spent a little time watching the bird feeders. 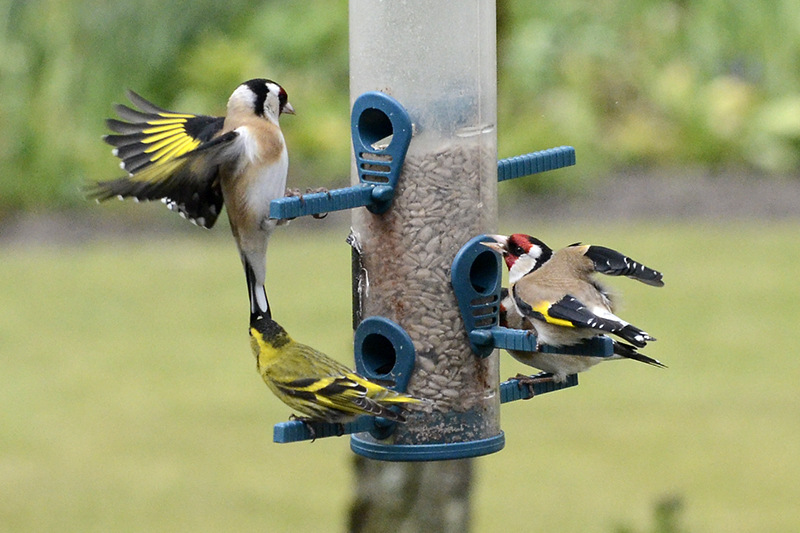 A goldfinch is thoroughly disgusted by another goldfinch doing acrobatic tricks with a siskin by perching on its beak. Then Mrs Tootlepedal went off to Canonbie, where she had one or two items entered in a WRI competition and I went for a walk. 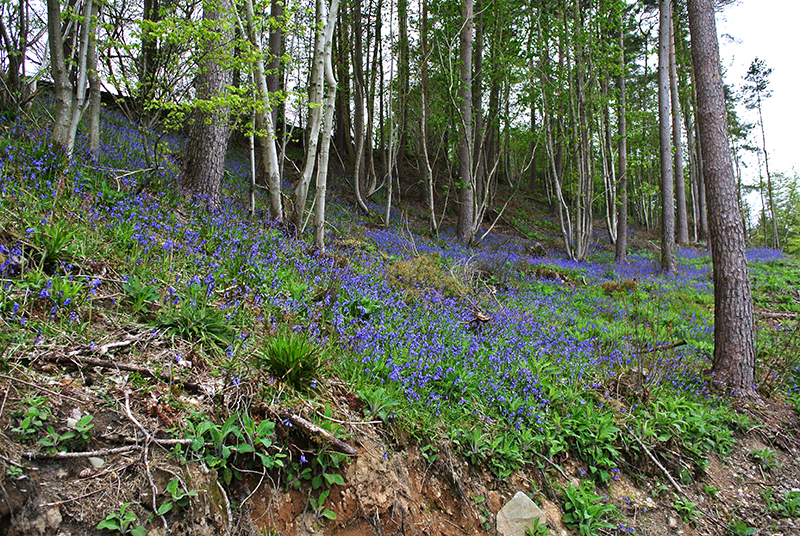 I was looking to see if the bluebells had improved at all but there were many other things to look at on the way. 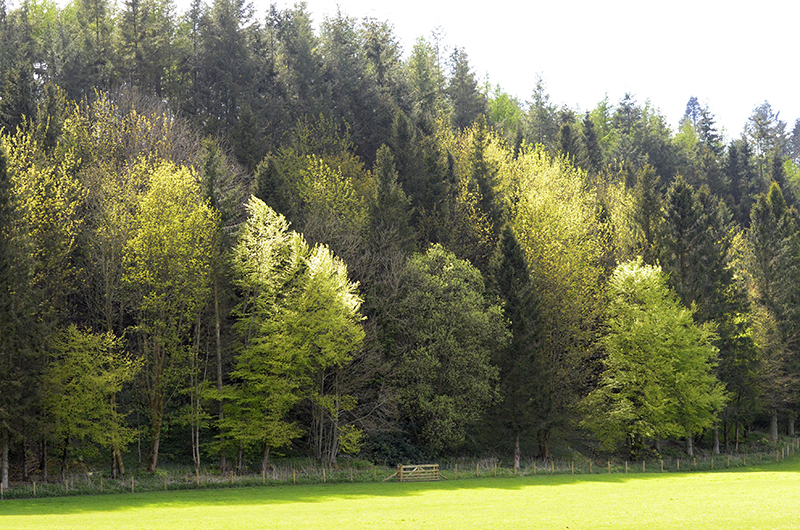 The trees along the Murtholm fields. 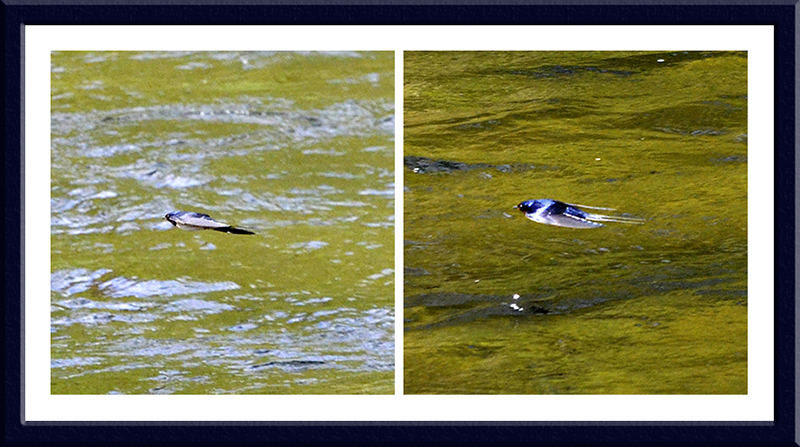 Swallows flitting up the Esk. It is amazing what a difference a slight turn of the camera makes to the light. 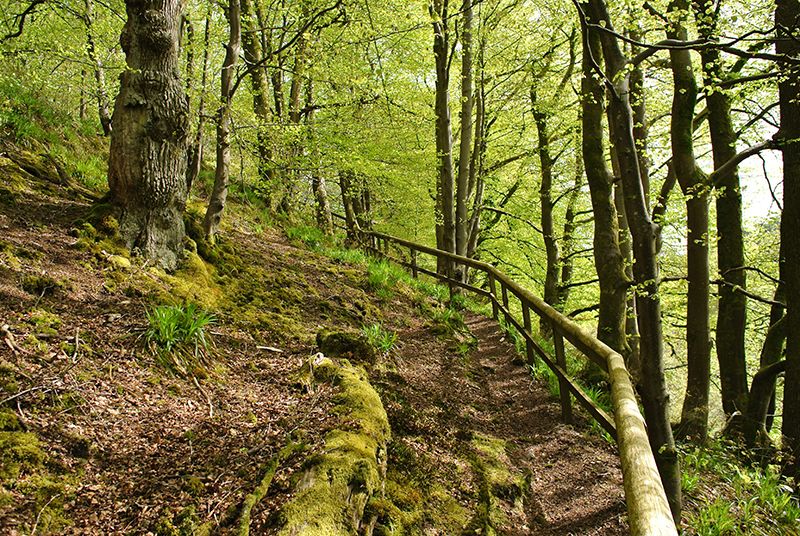 …and I thought that the walk along the main road to get to them was just as rewarding visually. I walked back over Skippers Bridge and took the obligatory picture. This time, I looked downstream. And then I climbed up a path to the old railway line above the river. There is a handy rail for the convenience of elderly walkers. …and then strolled back down the hill into the town. 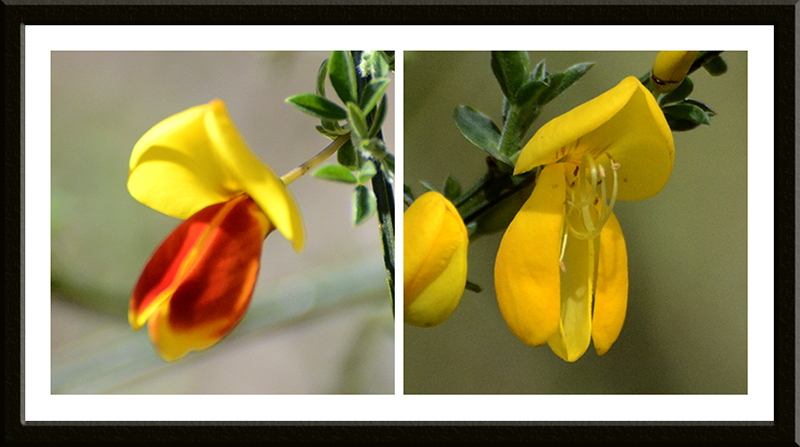 Beside the track, I saw the first broom flower that I have seen this year. It was about to open. A few yards further on, I saw two that had opened. Further on still, I had another look at the flowering nettle which I have photographed before without doing it justice. This is one of those tiny flowers that you might well pass by without noticing it, if you hadn’t had your eyes opened by walking around with a camera. I find it hard to capture yellow flowers well but this was my best effort yet. I went down to the river in the hope of seeing some interesting water birds on my way home but had to make do with some flowers beside the water. White bluebells are quite common but I don’t think that I have seen a pink one before. When I got home, Mrs Tootlepedal had returned and I was able to eat a couple of slices of her third-prize winning tea loaf with my refreshing cuppa. It was delicious. The first and second prizewinners must have been really good stuff. 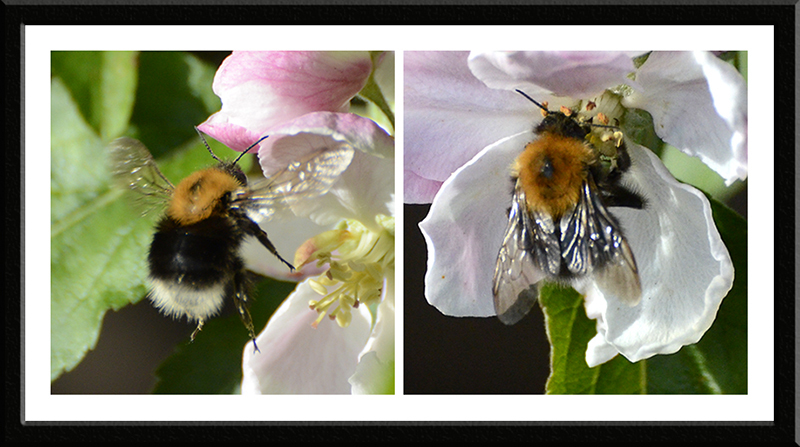 I was also pleased to see a bee hard at work among the apple blossom. In the evening, I went off by myself to the Buccleuch Centre to hear a band called Elbow Jane play. There was much to admire about them; their sound level was very reasonable, the bass and drum players were efficient and discreet and the three front men were all good musicians. On the other side of the coin, their set went on too long, and their singing was a bit relentless so in the end it rather felt as though you had been shouted at for two hours. As well as their own songs, they covered Paul Simon, The Beatles, Credence Clearwater Revival and Joni Mitchell which gives a good indication of their influences and although it is music that I like, they never really managed to bring an involuntary smile to my face or get my toe tapping for long. Still, a live concert 300 metres from your front door is always a bonus and I enjoyed myself. 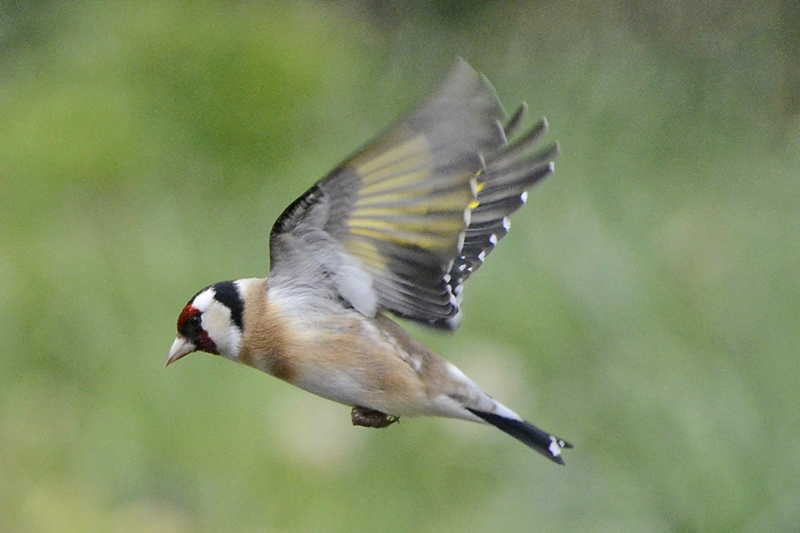 The flying bird of the day is a goldfinch. The picture shows just how well balanced these birds are in the air while their wings are flapping furiously.